Want a marketing strategy that can give you 1000% in returns? With over 150 million direct mails sent in 2015 as part of promotions, print marketing is more than alive today. Unlike emails that are often skipped without notice, 2.5 billion coupons were claimed when sent by print mail! More often, digital technology is distractive while direct emails have an engaging effect on the receiver. However, you can send zillions of emails at the cost of one or two direct mails to a few people. So, which one is best for small businesses? One of the earliest modes of marketing since ages, direct mail can reach the people who are not yet active digitally as well. Emails are not as welcome as a hand delivered mail to a major audience around the world. Direct mail involves sending a promotional letter directly to the audience to their physical address. There is no way to assess whether the promotional letter you sent reached the target audience unlike traceable emails. To ensure direct mail marketing is the most effective strategy for you, sneak a peek at the pros and cons. Getting a personal mail with a colorful brochure, coupon code or branded postcard is an excellent tool for marketing. It increases the trust quotient of the campaign and makes a deeper impact on the customer during delivery. Personal mails have a better exposure to the best audience. Unlike promotional emails often customized to skip the inbox, direct mail advertising will give you a window of more than a few minutes to captivate the reader. Print marketing can take hours to churn out the right design that fits the budget of the customers, simultaneously converting them. Direct emails can spike your expenses without doing the same to your profits, unless you target the precise demographic of customers interested in your services. The trick is to build a receptive mailing list. The cost-effective alternative for the neo entrepreneur, Email Marketing is dirt-cheap, effective and quick to apply on any campaign for a little extra boost in conversions. Email marketing involves sending direct emails to your subscribers online via, email services or social media groups. Unlike Direct Mail Marketing, Email Marketing can be used to send millions of emails by one-person within a click under a few minutes. It cannot replace direct mail campaigning, but it can substitute direct mail marketing for small businesses. The cheapest and fastest option to send multiple mails at once, Email Marketing is an excellent way to begin applying your marketing architecture or to escalate the target reach with a limited budget. Without any production fee for the paper to postage, the return of investment in email marketing is high. You can also track the response and click rate of your customers when you use email marketing with professional software such as MailChimp or AWeber. Email campaigns are effective only when they offer a superb giveaway or discount. It is nearly impossible to find a person awaiting a promotional email unless it has something of real value to them. Even if you create an attractive sale or giveaway, your audience may miss it just because it is a promotional email! 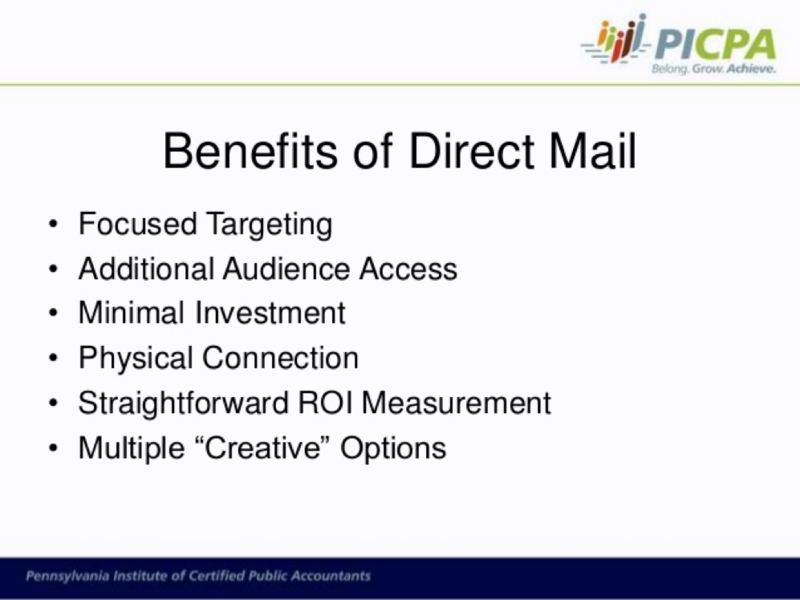 Advertisers in U.S spent $167 per head for direct mail campaigns and earned 1300% in ROI. Statistics project that up to 90% mails are opened, no matter what day it is while only 30% emails are opened. To make it clear, up to 3.7% people respond to direct mails while 0.2% responded to ad banners, 1% to social media ads, 1% to email ads and 2% to mobile ads. If you want your business to thrive in the current rat race of competitive marketing strategies, it is time to use traditional marketing strategies. It takes less than 8 seconds for an online reader to dump a promotional content and move onto other topics. On the contrary, statistics show that direct method of mail marketing results in 79% converts against email campaigns. Unlike email marketing, printed promotions keep the reader glued to the content. Moreover, as there are numerous ads online even the Super AdBlock cannot block, online promotional emails are rarely read completely. On the contrary, direct emails ensure a targeted personal attention to the reader. Many people love it when brands add a personal touch to the direct mails. There are people who cherish birthday cards send from companies too! If your promotional content is a lovely piece of paper, the audience will find it hard to lose it. This is because, from internet problems to wrong keyword entries, many issues can add to losing track of your important emails unlike a direct mail, which demands manual labor to be put off. Easier to find during emergencies, printed promotional content is almost always opened and verified by the addressee, unlike emails. You can find direct mails even when there is no power or internet. Moreover, unlike a Weekend Sale notified via email, direct mail receivers will come back to the promotional item more than once after the first read, if it is worthwhile. The digital world is filled with virtual magic and offering goodies of real value to your audience will definitely make a mark on them. The most powerful method of marketing, word of mouth works the best with direct mails. With statistics showing 1.5% increase in sales and up to 10% increase in WoM marketing, it is the best way to offer valuable referrals and rewards to your customer. If you send postcards with your brand or logo, the customer will promote you free of cost when they share it automatically with friends and family. Unlike promotional emails forwarded to the junk folder, most people read their direct mail even if it is labeled junk. Moreover, if a person reads your mail, they will remember it more effectively than a junk mail according to the science of cognitive load. Just like designing and polishing a website to make it enticing or to boost conversions, your direct mails needn’t be a dull black and white form. Make it colorful and easy to engage for better results. Replicating the SEO keywords and similar strategies often applied for online content to direct mail adds to the profits. Small businesses that combine print marketing to complement or highlight their online offers find it easy to connect and multiply sales. With over 98% customers rummaging the mailbox for personal mails nowadays, there are many ways to outsmart your competition with the print media. Direct Mail also entails 5X response rate, with respect to emails. In short, regardless of what your competitor offers, the customer will open a direct mail sent by you, unlike emails. Most businesses adopt email marketing campaigns more than ever now. Simply put, that leaves the market space wide open with lesser competition than in the digital world. Hence, don’t jump on the ‘Print is Dead’ rally, instead boost your sales with print right away. With 71% leads on the internet being unchecked and unused, print marketing boasts maximum success. According to studies and statistics, print marketing has the highest return and conversions when compared with other marketing media. Unlike print mails, companies do not need to spend huge fractions in developmental costs. Direct mail is the least neglected form of advertisement, as the ROI in print is 18% to 20%. Moreover, 62% people who opened their mail also moved forward with the purchase. Simply put, if your content offers specific value to the potential customers, you will make a conversion! 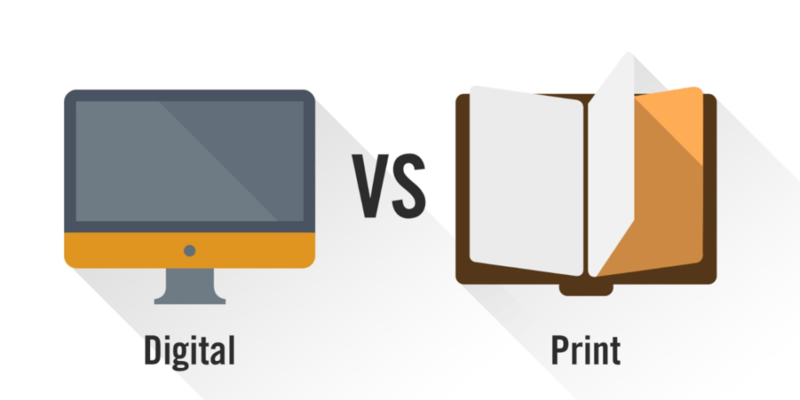 There is a wide variety of attractive options to impress the reader with your print marketing. It is important to use fun designs and content to captivate the customer instantly with print. A wide number of alternatives are available for print marketing such as the below. The golden rule is to look for economic options, but avoid compromising on design and content. Every new technology comes with its own set of demands of privacy in the digital world. Electronic media marketing is becoming a threat than a convenience with spam filters skipping images to attachments in fear of security. 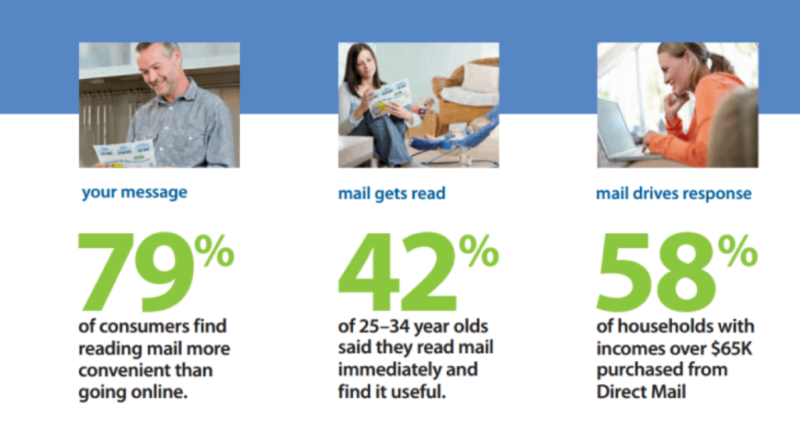 The same is why over 56% people trust direct mail, more than an email from the same company. In such a scenario, actionable print media can multiply your profits by guaranteeing results. Moreover, 59% also claimed that they look forward to branded mails. According to a recent study on neuromarketing, promotional content seen in print also affects the brain differently, making print trustworthy. 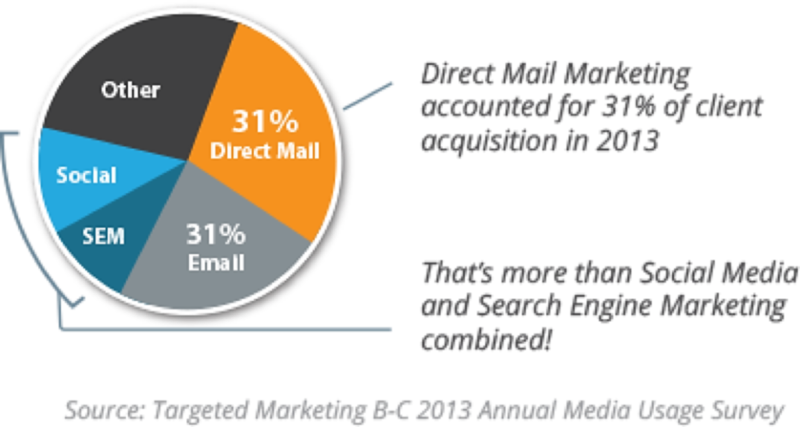 Direct Mail is proved to attract more results than digital marketing options such as emails. Both the marketing strategies are effective, depending on the audience you hope to reach. Hence, a strategic combination of print and media can boost your conversions and sales quickly. While one can save costs, the other can make conversions!